I absolutely adored the first book in this series, Alice in Zombieland, so I was incredibly excited to start reading Through the Zombie Glass by Gena Showalter. These are the only two books by Gena Showalter that I've read so far, but I'm quite looking forward to reading something else by her. I love the characters she's written and their relationships to each other. Because of the fact that many sequels I've read this year have been disappointing, I was slightly nervous to read this book. I shouldn't have been and I hope that you don't remain hesitant either. I was able to dive straight back into this story without any confusion and I quickly fell under its spell. With Alice in Zombie Land, I really enjoyed seeing little glimpses of familiar things from Alice in Wonderland. It was comforting to read a book involving zombies and families dying in which there is also fluffy white rabbits in the clouds that is sending a message because I knew that in some small way the overall structure of the novel was following a familiar theme. I didn't have any previous knowledge like that with Through The Zombie Glass. There is a storyline that involves Ali's reflection in the mirror that I imagine would also be a storyline in Through the Look Glass, but other than that everything in the story was a new discovery. All the other people we met from book one are here - Ali, who's just found out about zombies and the slayers who kill them. Her Nana, who I love to bits with her wacky 'teen' vocabulary and overall awesome ways. Kat, the somewhat annoying but loyal best friend with relationship drama. Reeve, the clueless friend that everyone is trying to protect. The other slayers, Bronx and Frosty. And of course Cole the brooding, smoking hot slayer and Ali's boyfriend who shared all those steamy visions with Ali. I think the two main things that are being dealt with in Through the Zombie Glass are trust and change - two very scary things and I loved how each of these things plays out throughout the novel. Things are supposed to be great between Ali and Cole now. Things went down at the end of Alice in Zombieland, sure. Ali learns she's got crazy-awesome powers but gets badly injured in a big battle and yes, Cole feels responsible for that. But he isn't supposed to pull away from Ali and keep secrets from her. So when two other slayers from Georgia, Veronia and Gavin, arrive they bring with them all kinds of drama. Because Veronica is yet another of Cole's ex-girlfriends set to win Cole back and if things couldn't get any worse, Ali shares visions with Gavin! There's so much more to this story than just relationship drama though. There's plenty of zombie-killing action and new information to be learnt - about Anima, Ali's powers, the visions, a spy in the midst. 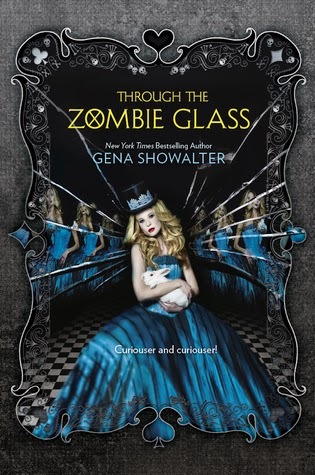 Everything about Through the Zombie Glass had my heart-racing and I cried at several points. This book is filled with so much emotion - heartbreak, determination, loyalty, passion. I await the next book in the series with baited breath! I LOVED the first book. Really really can't wait to read this one. Great review! Me too! And I loved this book just as much. What a great series. I am excited for more. I'm not sure if I've heard of these before. It's not really my kind of thing but with such a positive review, perhaps I'll have a look for them! And I ADORE that cover, it's just gorgeous. Fab review! Yes! This series has amazing covers so far, I've been really impressed. I recommend them. Zombies aren't generally my thing, but these books are so fantastic..